Are your nighttime cravings taking over? NightFood snack bars are specially formulated as a healthy snack option to satisfy those after-dinner cravings. How often do you find yourself trying to eat the right stuff all day only to mess it all up at night with cookies, chips, ice cream, or candy? That's what we call a "SNACCIDENT". There are biological reasons we get the munchies when we get tired, and we're drawn to that unhealthy stuff almost every night. Do you ever really have a "healthy dessert"? Whether you refer to it as midnight munchies, late-night snack attack, killer cravings...it's all the same. At night, your appetite is strongest, cravings are junkiest, and willpower is weakest. That perfect storm is what we at NightFood call "The CraveMonster". Experts recommend a small, healthy bedtime snack of 150 - 200 calories, consisting of mostly complex carbs, with a moderate amount of protein, and a lower glycemic profile. 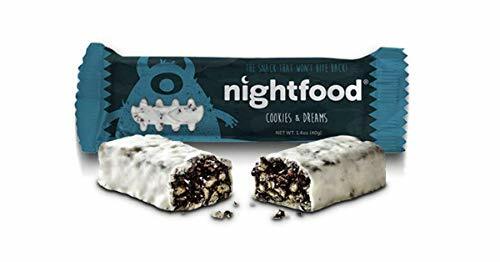 We formulated NightFood to be exactly that, and with GREAT taste and high in fiber....it' doesn't taste like a yucky weight loss bar. Each bar also contains a full 500mg serving of patented Chocamine, a proprietary, caffeine free cocoa extract that delivers the many health benefits of chocolate, without the extra fat, calories, and sugar you get when you eat chocolate candy. If you haven't tried NightFood, order a box...or, order two so you can try both flavors. You're gonna love your new bedtime healthy snack for kids and adults. As you approach bedtime, hormones in your body basically give you the "munchies". Don't end your day feeling guilty because you gave in to cravings. Have a healthy snack that won't mess with your sleep , tastes delicious, and will keep you away from the junk! SATISFACTION 100% GUARANTEED. Don't like the bars? Easy! Just contact us for a refund. No need to send the rest back...just share remaining bars with friends, family, neighbors, and coworkers. NightFood is NOT an energy bar or protein bar! Avoid energy bars before bed. NightFood snack bar's sleep-friendly nutritional profile means you won't find the same energy boosting ingredients loaded in those other daytime healthy snacks. Sleep experts agree the best bedtime snacks are mostly complex carbs, high in fiber, and not too much protein...lower glycemic, and around 150 calories. NightFood was formulated by our food scientists to be exactly that, AND taste DELICIOUS! Unhealthy night snacking is the single biggest weight management problem for most health-conscious people, and it messes with your sleep, which leads to all kind of other problems tomorrow. Don't let unhealthy midnight cravings wreck your diet and your sleep. Not just for people wanting to lose weight, NightFood snack bars are a delicious, healthy snack you can enjoy guilt-free, so you can stay on track, even when those midnight munchies hit. If you have any questions about this product by NightFood, contact us by completing and submitting the form below. If you are looking for a specif part number, please include it with your message.